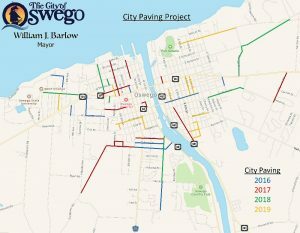 OSWEGO – Mayor Billy Barlow is proposing a $657,000 paving plan for the city of Oswego this summer, a plan that focuses predominately on the east side of the city. Barlow said the city has paved approximately $2.5 million worth of city streets since 2016, with this year’s plan sending that total to more than $3 million. The city paving projects in the last three years have been supplemented by a considerable amount of paving done by New York State in the Oswego area, including State Route 481 and State Route 104 last year. Councilors will consider approving the paving plan and sending it out to bid Monday during the Administrative Services Committee meeting at City Hall at 6:30 p.m.